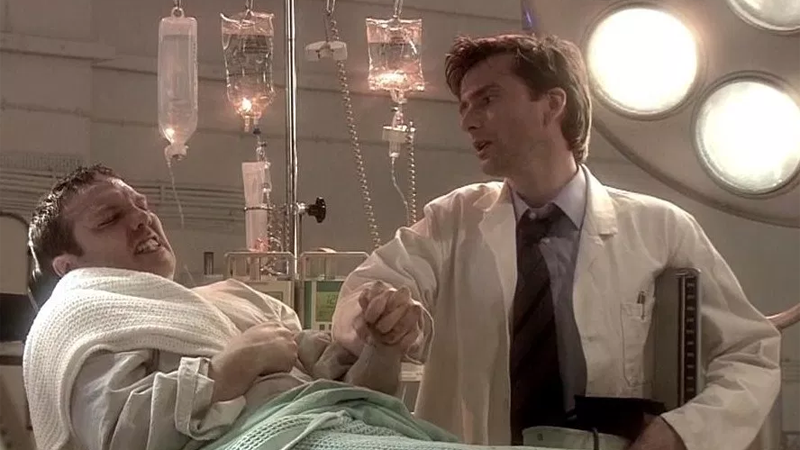 David Tennant as Doctor Briscoe, one of Quatermass’s fellow scientists, in the live 2005 TV remake of The Quatermass Experiment. It broadcast just weeks before Tennant was officially revealed as Doctor Who’s next Doctor, fact fans! Legendary—who are on a tear lately when it comes to confirming a bunch of adaptations and reboots, with everything from My Hero Academia to Detective Pikachu to Dune falling under their purview—have confirmed that they’re working with Hammer Films to turn The Quatermass Experiment into a new movie, with Hanna’s David Farr set to write the script. Originally a series of BBC serials in the 1950s, where the titular Quatermass was played by Reginald Tate, The Quatermass Experiment was set in a near future where Great Britain had successfully launched the first manned space mission, overseen by Quatermass and his team of crack scientists. When the mission returns with several astronauts missing and one gravely ill, however, Quatermass and his team find themselves having to confront the possibility that a sinister alien presence has come to destroy Earth. It’s regarded by many to be the first piece of “adult” sci-fi to be specifically written for British TV, and its influence can be felt in British classics like Sapphire & Steel and Doctor Who. Although the original series was just six episodes long, over the 20 years that followed the original Quatermass serials, several new stories revolving around Quatermass’ thrilling, horrifying encounters of the third kind were made. In 2005, the BBC even remade the original serial as a live TV event, with Quatermass being played by Lock, Stock, and Two Smoking Barrel’s Jason Flemyng. It’s not really unkind to say that this is some really deep digging for Legendary when it comes to finding a known IP to turn into a movie. Although Quatermass’s roots are fundamental to the earliest days of British sci-fi television, it’s the sort of low-key sci-horror that you wouldn’t really expect out of a modern blockbuster movie. And removing it from its TV roots and upping the ante might rob part of what made Quatermass so originally unique in the first place. We’ll have to see, but we’re more than happy to see scientists encountering the weird and the alien on the big screen, at least.